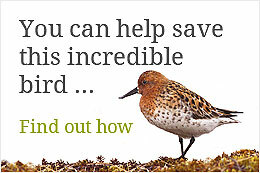 Saving the Spoon Billed Sandpiper » Where have the tracked spoonies spent the last few months? Where have the tracked spoonies spent the last few months? The last time you heard from us about the birds that are being satellite tracked was on the 17 November last year. Why no news since? There simply hasn’t been much to report. But no news is good news. 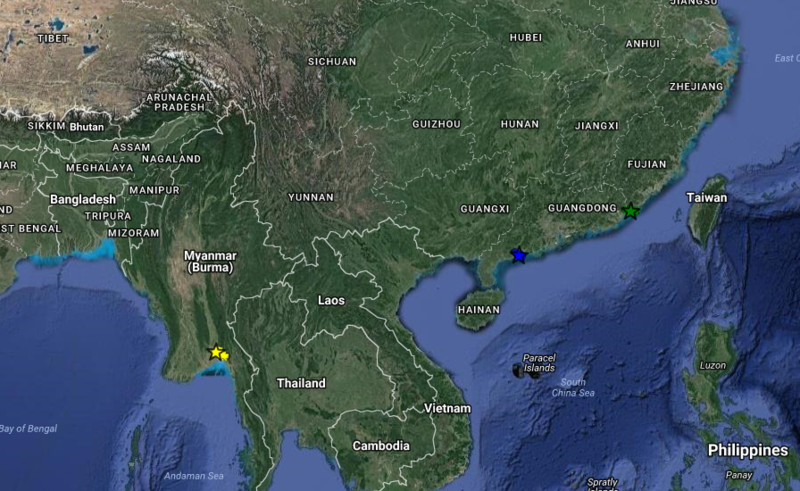 ET (yellow star) in the Gulf of Mottama in Myanmar, about 1,500 km further west than HU and over 2,000 km further west than CT.
All the tags are still functioning and it has been fascinating ‘watching’ the birds winter. In early January, we prepared a poster summarising the tagging efforts so far which was presented at the Arctic Migratory Birds Initiative (AMBI) East Asian-Australasian Flyway workshop in Singapore (8-10 Jan 2017). Here’s a copy of the poster: SBS tracking poster (right click and ‘Save target as’ to download). 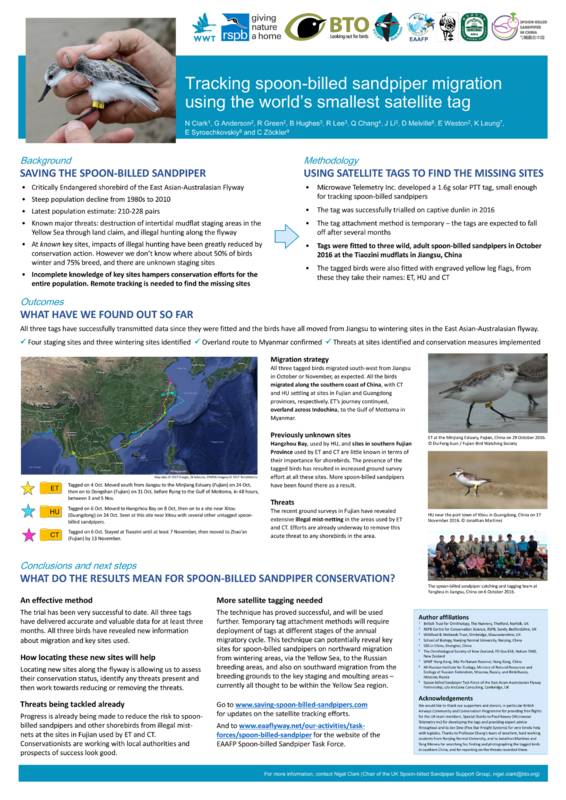 Spoon-billed Sandpiper satellite tracking poster presented at the Arctic Migratory Birds Initiative (AMBI) East Asian-Australasian Flyway workshop in Singapore (8-10 Jan 2017). We’re now eagerly awaiting the first move east or north showing a bird beginning its journey to a breeding site. Stay tuned! Thanks for the update. It is good to know that the birds have had a peaceful winter. Fingers crossed for safe returns to the breeding grounds. I would like to personally congratulate you as your blog Saving the Spoon Billed Sandpiper has been selected by our panelist as one of the Top 80 Bird Blogs on the web. I personally give you a high-five and want to thank you for your contribution to this world. This is the most comprehensive list of Top 80 Bird Blogs on the internet and I’m honored to have you as part of this!